New York Investigating New Device To Crack Down On Cellphone Violations, But Is It Constitutional? 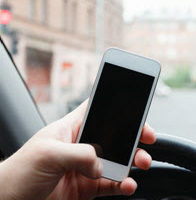 According to the Institute for Traffic Safety Management and Research, almost 3,000 people were injured in cellphone-related crashes in New York between 2011 and 2015, with more than one million tickets issued for cellphone violations in that same time period. On July 26th, New York State announced that it would set in motion a series of studies behind the “textalyzer,” a device that would allow police to determine whether a motorist involved in a crash was texting, emailing, or otherwise while driving (similarly the Breathalyzer identifying drunk drivers). The device would work by being plugged into a person’s phone for approximately one minute, whereby it would then indicate whether the person was texting, emailing, looking at the internet, or otherwise using his or her cellphone before a crash. The device is currently being developed by an Israel-based company called Cellebrite and, reportedly, would not access private information also stored on the phone (information such as personal emails, pictures, or web browsing history). However, security experts are skeptical of this claim, and have pointed out that there are already legal options for police officers to obtain this kind of information without having to hand over cellphones to law enforcement. Although still some months away from officially being ready to be used in the field, the state and its governor appear to be in favor of arming its police officers with the device. However, that’s not to say that the device doesn’t also carry some worrisome implications insofar as raising privacy and constitutional questions. In particular, how does this comply with civil rights if police typically have to obtain search warrants before looking at someone’s phone? The Governor’s Traffic Safety Committee is examining the technology and the potential civil rights issues it raises, and will be taking comments from opponents and supporters of the technology before coming out with its report, which is projected to focus on how the device will be specifically used and the constitutional and legal issues the device invokes. However, many believe that it is just a matter of time before New York and other states adopt the technology, particularly since there has already been legislation sponsored establishing rules for the use of the device. If you have been cited for a cell phone violation and/or the victim of unreasonable search and seizure of your person or property in the conviction of a crime, you need to speak with an experienced New York criminal defense lawyer right away in order to ensure that your rights are protected. Contact the office of Phillip Murphy today for a free consultation and we’ll discuss your options.